395 Acre Gated Greyledge Sanctuary.... A Secluded Retreat gorgeously & serenely set overlooking a scenic Outdoor Swimming Pool & Patio, Huge Pond w/ Gazebo, surrounded by your own Mountains. Custom design: Sunken LR w/ Wood-burning FP, Huge rooms, High Ceilings. 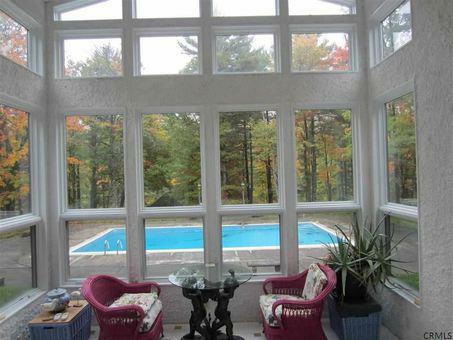 62 x 36 Indoor Pool Rm w/ heated salt water Pool & Commercial grade dehumidifying system. 2 Buderus Boilers, 2 Wells, Fitness Rm w/ Private Bath. 3 Car Detached & 2 Car Attached Garages. Gut renovated 2005-2007.